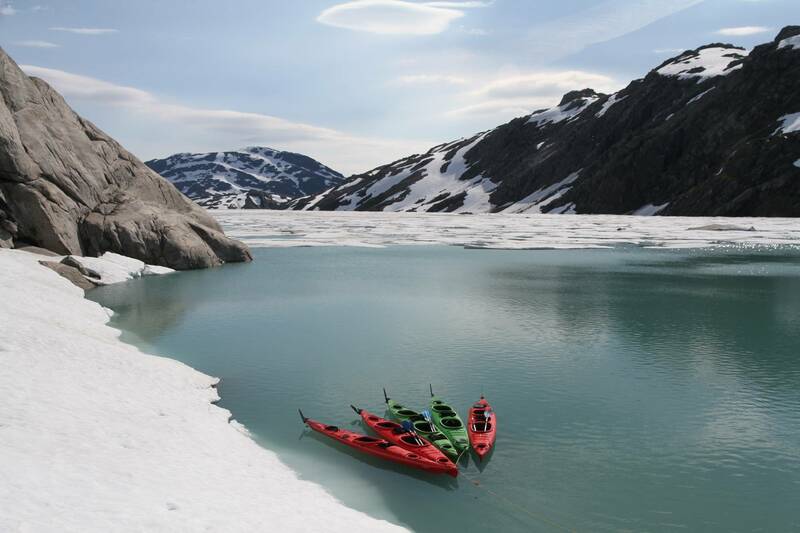 Glacier kayak is Folgefonni Breførarlags's signature trip – taking you up by the Folgefonna Glacier 850mas. 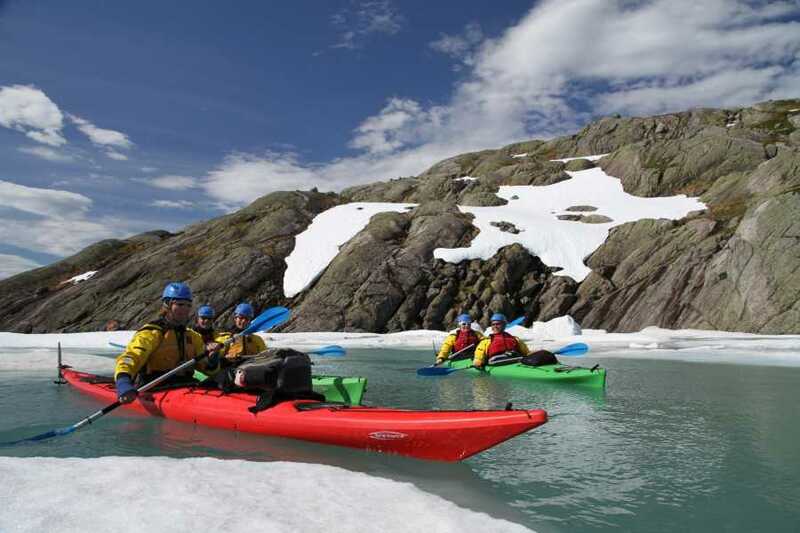 Full-day adventure including safety introduction, kayaking and blue ice trip (Blue Ice trip only possible if ice conditions are good, no garantee). All necessary equipment including dry-suit and glacier equipment are included. Duration app. 6-8 hours. This is Folgefonni Breførarlags's signature and most exclusive tour. We meet you in Rosendal to check equipment etc. then we drive by car for about 40 minutes to the starting point, please tell us if you do not have your own car (to be sure we have space for you in our mini bus). 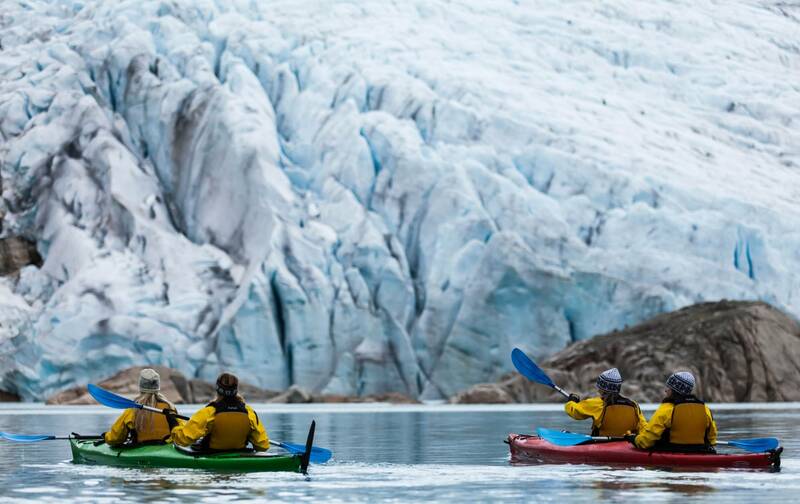 Trip start with a kayak trip in the glacier lake, dry suits is used to ensure safety, water is cold. If lucky, there are icebergs in the lake on our way from starting point to the Møsevass Glacier. 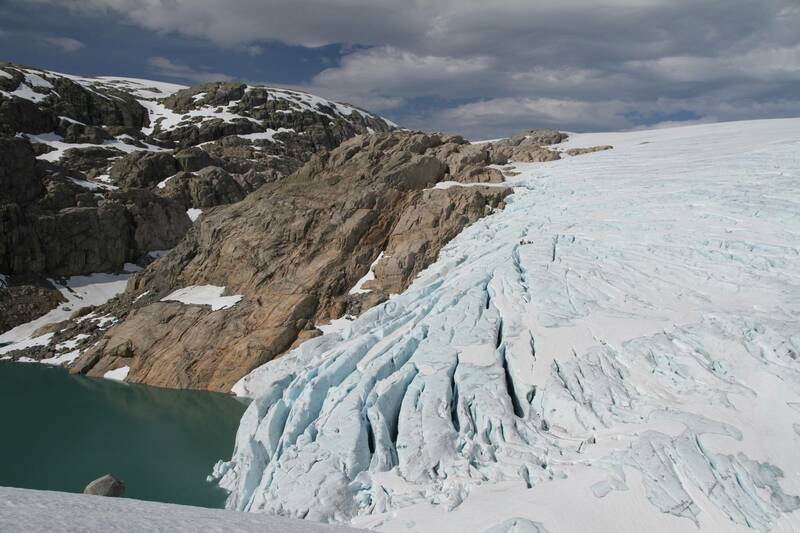 The view of blue ice coming into the lake is powerful; no one can stop the ice on its way to the lake. 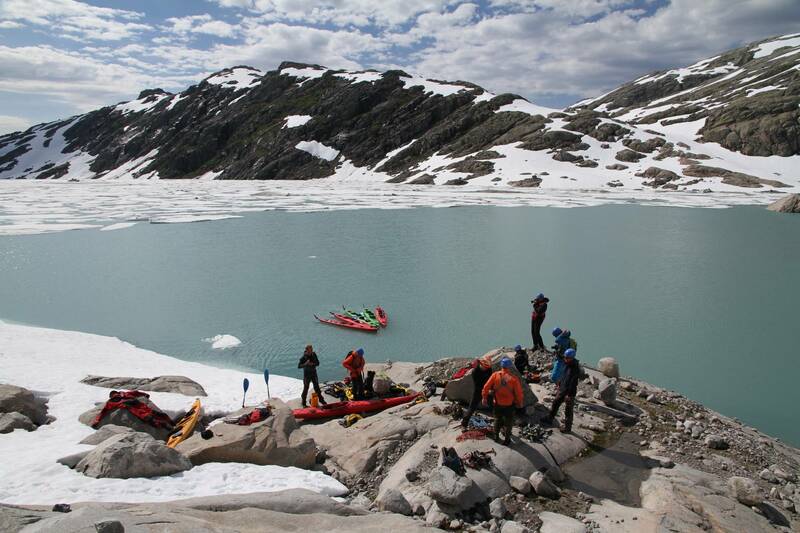 We park the kayaks on a beach nearby the glacier and take lunch. If glacier front is stable, and ice conditions are good we put on glacier equipment and are ready for a fairytale in blue ice. 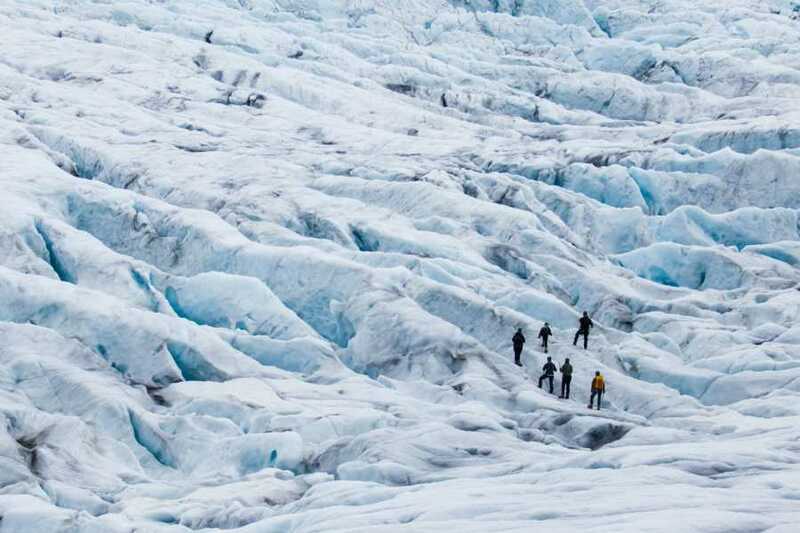 We go for a calm hike in the ice for sensing all elements or we do a real ice-climbing adventure, this depends on your wishes and the ice conditions. 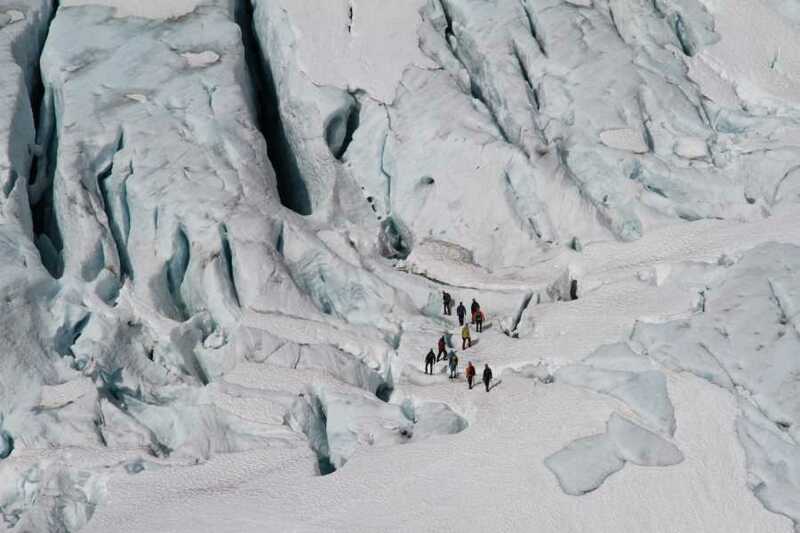 We can not garantee we can access the glacier during the whole season due to changes on the glacier. 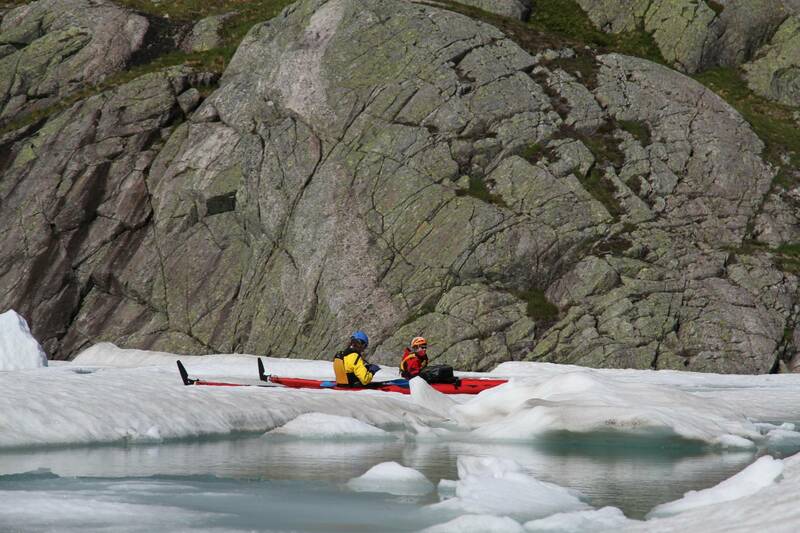 If so we offer Blue Ice Hike in Juklavass for free included in Glacier Kayak price (must be done another day). From 1th of July until 15th of September, but depend on that lake is free for winter ice, and road up to lake is not slippery. 6-8 hours. 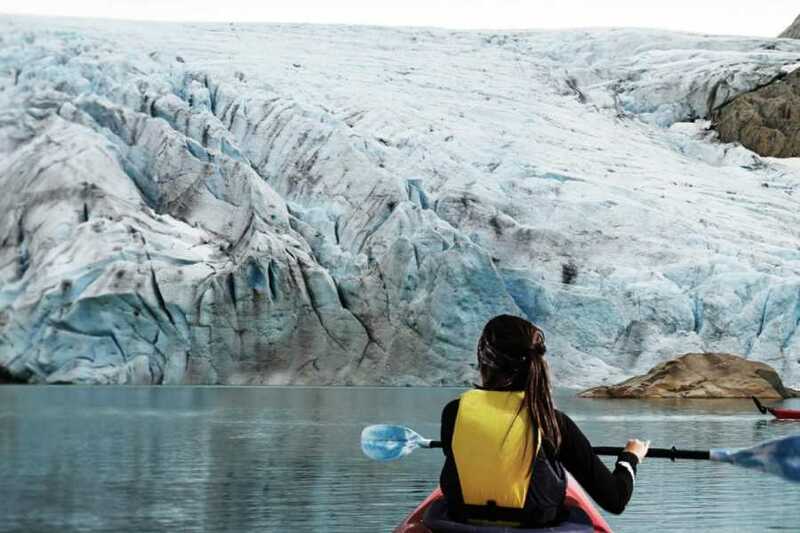 The total paddle tour is about 5 km, glacier hike 1-5 km. We recommend bringing wool underwear, and warm/wind/water proof clothing, mountain boots and gloves. We also recommend bringing sunglasses and sun lotion. All your clothing can be wet if you are unlucky and turn over; please bring extra set of clothing so you can change after the trip if needed. You should also bring a towel. No warm shower is available. 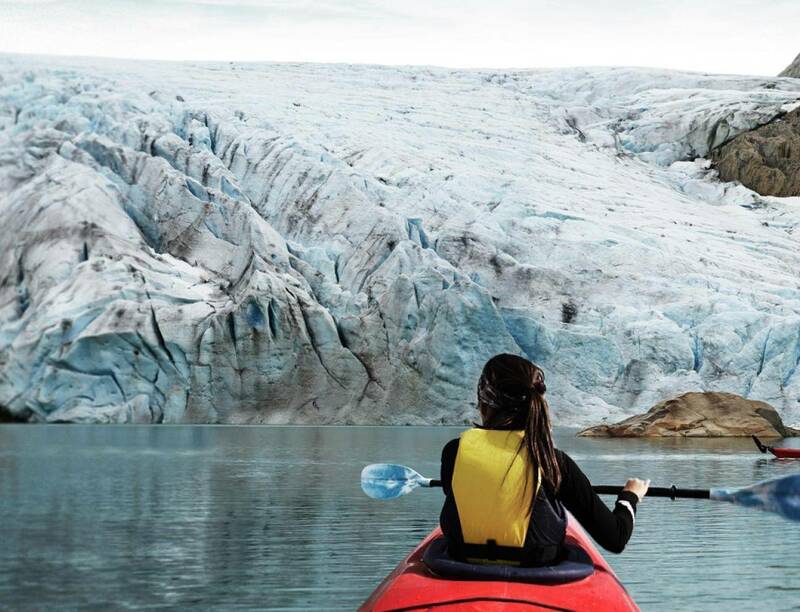 We provide all necessary kayaking equipment, and glacier equipment (crampons, harness, helmet, ice axe and ropes). We can also bring mountain boots for you; we need your shoe size when booking the trip. 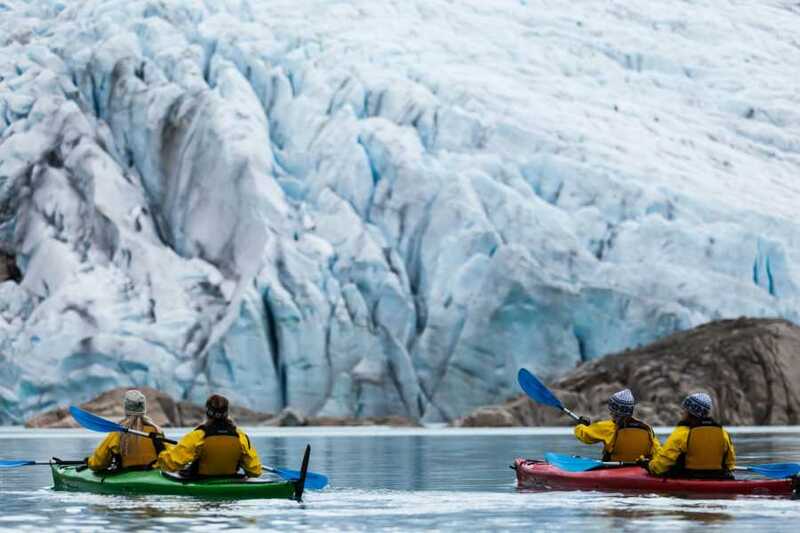 Price includes all necessary kayaking and glacier equipment. 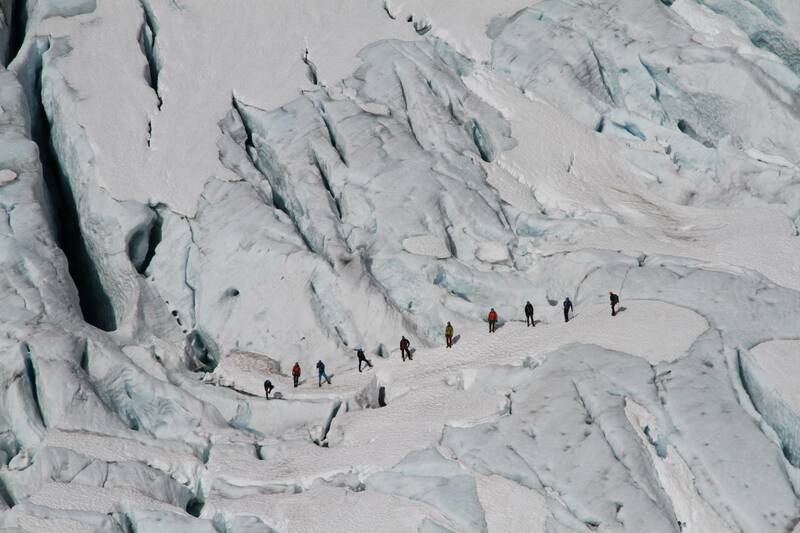 All people above 15 years old and in normal conditions. The trip will be adjusted for the whole group. Travelling to Rosendal is easy. The village is connected by buses, boats and roads from Bergen, Oslo and Stavanger. If you rely on public transportation, we recommend taking the express boat leaving twice daily from Bergen to Rosendal, in less than 2 hours. Bergen is the closest major city to Rosendal. Either public or private transportation is easy and fast. Public alternatives are the express boat “Hardangerfjord Express” leaving from downtown harbor or the bus line 760/761 leaving from Bergen central bus station. By car the fastest route is approximately 2 hours 30 minutes including one ferry crossing. Find the route here. Stavanger is the second largest city on the west coast of Norway. We recommend the express bus service from Stavanger to Bergen and then change to express boat or bus to Rosendal. By car the fastest route is approximately 4 hours 10 minutes including two ferry crossings. We prefer online booking, but also possible by phone (+47 95117792), e-mail or at our booking center in Juklafjord (Jondal). For online booking you need to be two persons or more in the group, if you are a less than two persons please send us an inquire booking. Paddling in dry suits, water is ice cold! Activety been on "71 Grader Nord"